Homemade donuts are all the rage. Make your own and you'll be the hit of the town. I've said before I will not trust anyone that says they "don't eat donuts". Please. Deep down I know you like them. It's like cake. Who doesn't like cake? For some reason people feel ashamed to say, "I had a donut for breakfast". I get it. They are a tad unhealthy. There really is no nutritional value. You will probably be hungry an hour later. That is why you have a second breakfast. The donut is the appetizer or a snack to the meal, if you will. So there. We should all be having a donut once in awhile. Life is short and these are fantastic. The end. The day I made these I was also bribing my 4.5 year old. Yep, I said bribing. She challenges me and sometimes and I succumb to parenting like a 4.5 year old. With just her and her sister at home in the afternoons I still make her "nap" or at least have quite time in her room. I NEED THIS QUIET TIME. She could take it or leave it. 60% of the time she will actually fall asleep, which is beyond wonderful. The other 40% of the time I hear her using the restroom, walking around in the hallway, shutting doors, singing, pretty much anything other than sleeping. In many trial and error moments I have found that she will work for rewards. I know, parenting hackers call me out, but it sometimes works. She lives to go with me in the mid-afternoon to pick up her brother from school, so I will often say, "If you nap, then you and your brother can have a special snack when he gets home from school". It is never anything crazy. Maybe hot chocolate. Maybe a homemade cookie. But when I'm usually offering apple slices or string cheese, it gets her attention. A few days ago it was homemade donuts. Yes, I made these donuts just so my 4.5 year old would take a nap. 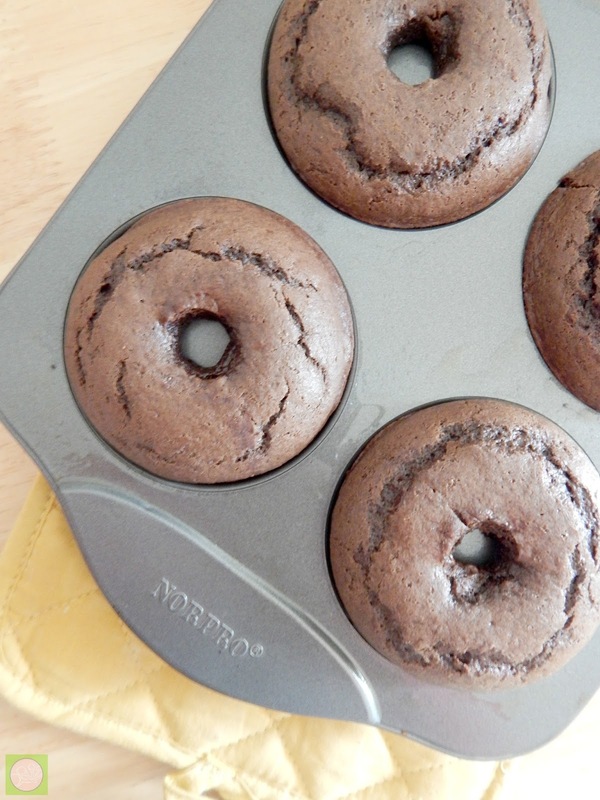 Baking homemade donuts is a breeze as long as you have a donut pan. I bought a simple one years ago on a girl's trip and have used it numerous times. It makes six donuts, which is just enough for this horrible breakfast craving. You can purchase yours HERE. It's on sale for $11! After I made these last week, I posted this cherry donut recipe on my Facebook page, hinting that I had the chocolate version baking in my oven and my local friends went a little bonkers. They are used to my random drop-offs of baked goods. I have a feeling they were all thinking, "will she pick me this time?" Well, one special friend got lucky. At preschool pick-up I casually handed over three chocolate donuts and told her to make sure her boys let her have one. These are moist, almost cake like...and the frosting? It's simple and light with just the perfect amount of chocolate. 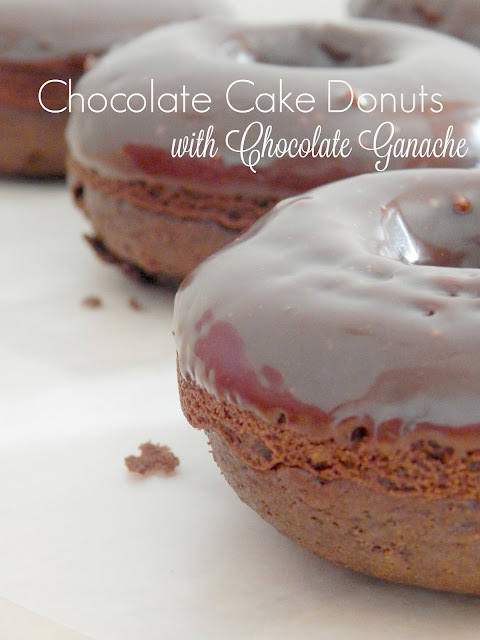 The ganache is made in the microwave in 1 minute.....so please don't skip this step, it's so easy and so worth it. 1. Preheat the oven to 375 degrees and grease the donut pan. 2. 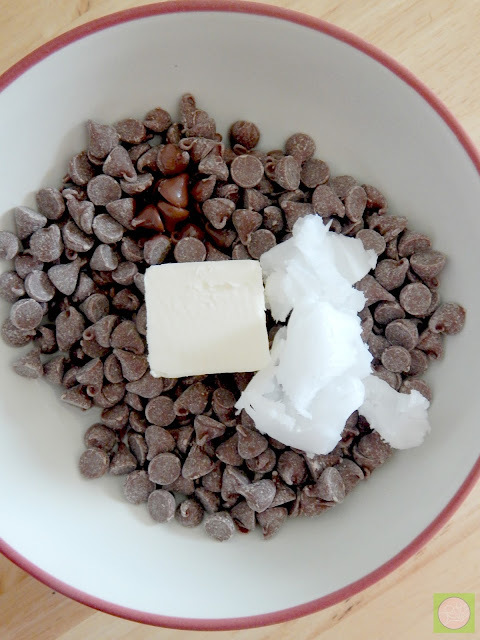 In a bowl beat the wet ingredients, then gently add the dry ingredients, stirring to combine. 3. 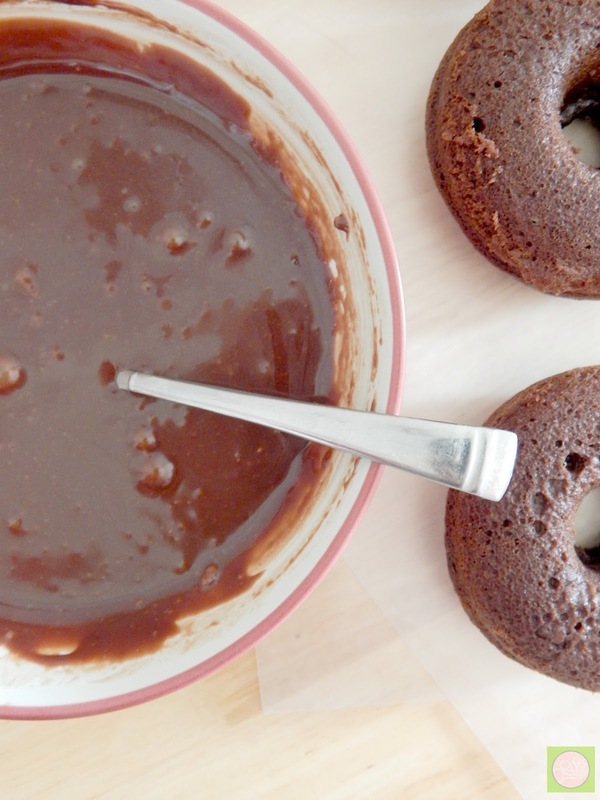 Spoon the batter into the donut pan, filling to the top. 4. Bake for 10 minutes or until the tops are slightly cracked and spring back to the touch. 5. While the donuts are baking, in a bowl combine the frosting ingredients. Melt in 20 second intervals stirring after each time. Do this until it is completely melted. 6. 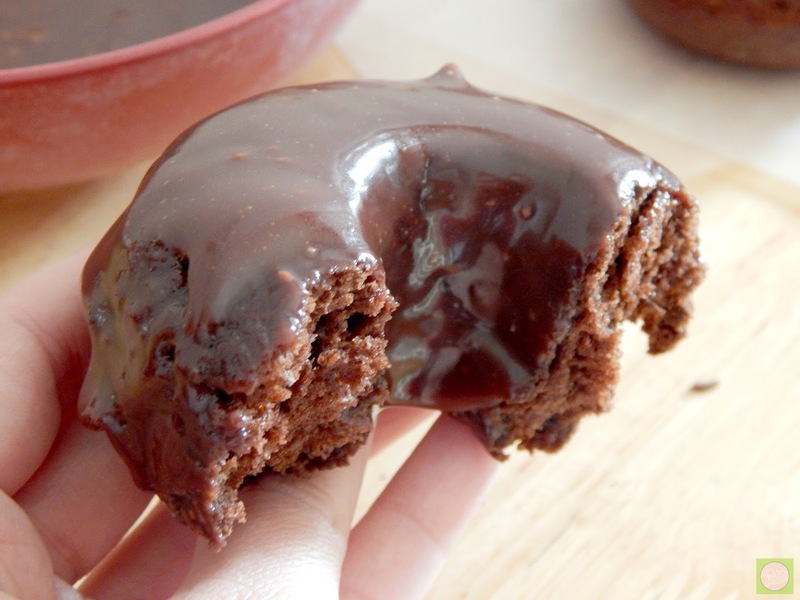 Using a knife, carefully remove the donuts from the pan. Dip the tops into the frosting, then turn over and let cool/frosting harden on a piece of wax paper. 7. Eat right away or keep in a airtight container to stay fresh. Oh, and I had quite a bit of frosting left over. Which in my head meant, I'll need to make another batch, but it never got that far. Someone may have slathered it between graham crackers for snack the next day.